In the beginning there was an argument. That’s why things are such a mess. This argument involved the earth and the sky, except that in the beginning they were as one: a swirling chaos of sparkling white light and dense black dust. But in time, the earth grew tired and sought rest—as all material things must. The earth heaved a great sigh, then separated from the sky and settled into solid ground. This made the sky angry; the sky did not wish to be separate. But the earth had its own desires and the earth refused to reconcile. So...the sky folded inward until it’d melded into a single spike of pure white fire. Then it plunged down into the earth, to spear the earth and try to become whole once more. A rough and shoddy business, yes, but that’s how the world began. Time and time again, the sky speared the earth, hoping to regain the whole. But finally—finally—the sky gave up and billowed back out to become the same blue dome that covers us even today. But the earth did not recover so quickly. It reeled and spiraled in dizziness; it wheezed and hacked and spat out its sickness, the sickness the sky had given it. This sickness came out as its many children: the ragged mountains, the sagacious lakes, the somnolent grazing plains, the mad roisterous oceans. And still the earth regurgitated: producing rocks that contained the mother’s fiery core, and ice so blue it could turn your dreams inside out. And still the earth regurgitated: goats and sheep issued from the maw of mountains; the waves crashed together, creating flashes of fish; the prairies groaned forth antelope and bison. Life poured from the earth like blood. And when all was finally said and done, a lively peace pervaded the place. Then, amidst all this wonder, man and woman appeared: they fell from a tree, the tree at the center of the world. For awhile, they just sat there, looking stupidly at one another, and at their hands, front and back, and at the clumsy feet attached to their knobby legs. They did not seem completely of this world; alone among the animals they had the awareness of something beyond themselves, though at the time, this awareness was but a dim buzz in the far black space of midnight. 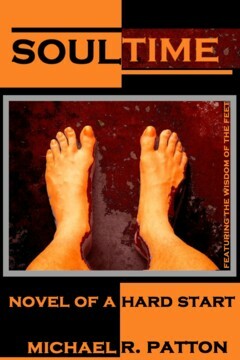 digital Soultime is currently available on amazon.